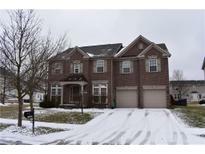 Below you can view all the homes for sale in the West Haven At Noble West subdivision located in Noblesville Indiana. Listings in West Haven At Noble West are updated daily from data we receive from the Indianapolis multiple listing service. To learn more about any of these homes or to receive custom notifications when a new property is listed for sale in West Haven At Noble West, give us a call at 317-910-4605. The covered lanai out back is perfect for enjoying a summer day or relaxing in the evening. MLS#21627082. ERA Real Estate Links. Please exclude: pool table light, green big egg, washer, dryer, magnet board in playroom, refrigerators in garage & basement. MLS#21619541. F.C. Tucker Company. One side of garage is tandem for plenty of work space or storage. MLS#21619355. Keller Williams Indy Metro NE.